This set comes with everything you need to create a school band. Includes Bell Hopscotch Rabbit, piano, drum, violin, trumpet, flute, and xylophone. Secret Island Playhouse is where critters go to swim, play, and have fun! Features 2 pools, caves, diving board, swim gear, fish, vine swing, 2 rooms with furniture, and more! Playhouse measures 12" x 8.75" x 15". Critter babies love shopping for fun toys! With a play corner and over 40 pieces including toys, activity table, chalk board, squeakers, rattles, building blocks, toy boxes, books, and more! Shop measures 10.25" x 6.25" x 6". Mother, Natalie loves teaching ballroom dancing to all of the wonderful critter couples. Father, Mason teaches tennis at the Cloverleaf Corners Youth Center. Sister, Lily loves to shop for pretty dresses and go to school dances! 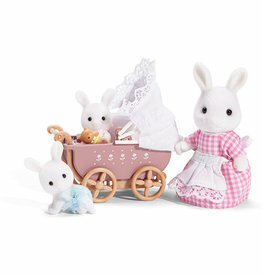 Prima ballerina bell hopscotch rabbit is getting ready to take center stage! she is practicing her ballet routines for a show-stopping performance in the ballet theater. She loves to twirl around and show off her dance moves! Marley loves playing in the baby pool with his twin sister. They like going down the slide and making a big splash into the water. Shiloh loves being the center of attention and getting her picture taken.